I had never tried broccoli rabe before, and could not resist it when i saw it at Market Basket here in Boston. Joe and I went there on our first grocery shopping here in Boston. It was about 9:00 a.m. on a Sunday morning and the store was PACKED. I have never seen a store so crowded at that time of day/ day of the week. It didn’t take long to figure out why – the prices are amazing! I though we were going to have to start budgeting more for food whilst in B-town, but now we might be saving money! I found this recipe in Food & Wine cookbook, which my Nana gave me as a moving gift. 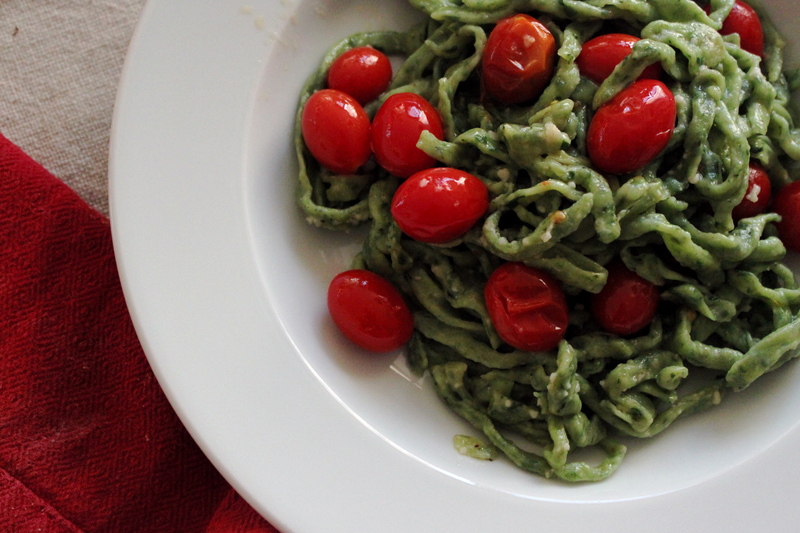 The book suggested using the pesto over crostini for Bruschetta, but i served it with pasta. preheat the oven to 350 F and put a large pot of salted water on to boil. sprinkle the nuts into a baking dish and cook for 15 minutes. boil the broccoli for about 2 minutes, drain and rinse with cold water. Squeeze and pat dry, then chop coarsely. combine garlic and nuts in a food processor and pulse until finely chopped. add the broccoli, parsley, lemon juice and olive oil and continue processing. use a spatula to transfer the mixture to a bowl, stir in cheese, and add salt and pepper to taste. with the pesto pasta, I made a simple romaine salad with homemade whole wheat garlic croutons. melt butter in a medium saucepan with the garlic. add the bread pieces to the pan, and toss in the butter. spread the bread out on a baking sheet and cook for 15 minutes, or until crisp and dry. Still maybe under the influence of Food Inc., veggie dishes hold more appeal than meaty entrees. There are more and more Farmer’s markets popping up all over town here in Charlottesville, and plenty of opportunities to get fresh vegetables. This recipe was found in the August publication of In The Kitchen, a sort of local, organic food newspaper that can be picked up at the nearby Whole Foods. The magazine centerfold has a month of recipes designed to minimize wasted food. So the chicken you roasted one night might show up a couple days later in a chicken salad recipe. The following recipe made enough for 7 adults, plus enough leftover for 2-3 lunches. I think this would be a great thing to make with fresh summer veggies, and freeze for wintertime. heat a couple tablespoons olive oil in a LARGE, deep rimmed skillet or two medium sized skillets over medium heat. Meanwhile, heat a large pot of salted water for pasta. add the eggplant, onion, garlic, squash, and red pepper to the pan and saute till caramelized (all soft). Meanwhile, cook the pasta (spaghetti, angel hair, or fettuccine work well) according to the package directions. in the last few minutes, stir in the spices. Serve with fresh grated parmesan cheese. I will start by saying that the pasta made just enough for 6 adults. Had I used a pasta machine, it could have fed 8. We used a combination of online recipes and The New Best Recipe book that I have falling in love with… Unfortunately the pasta dough was intended for a pasta machine – but i thought i could work it by hand. I rolled it out as well as I could, but the elastic, resilient dough resisted my efforts and in the end was twice as thick as it should have been. I would not attempt this dough again without a pasta machine or very strong helper. The ricotta filling was delicious. The recipe below made just the right amount to go with the pasta. Joe made an amazing red sauce. If I had been making this alone, i would have used jarred sauce for times sake. We served the pasta with some French Bread from my most recent BBA Challenge, a salad, and some watermelon. rinse a large, heavy duty pot with cold water. This helps the milk from adhering to the pot. Add milk and heat to roughly 180°F, stirring occasionally. Once the milk has reached 180°F, remove from heat, add vinegar and salt. Stir ONCE, cover with a clean dishtowel or cloth napkin, then let it sit undisturbed for 2 hours. Line a colander with cheesecloth and set so that it can drain over a large bowl. Scoop the curdled cheese from the pot with a slotted spoon into the cheesecloth. Let it drain for 1-2 hours depending on the creaminess you want. We were crunched for time, so Joe pressed the cheese with the cheesecloth, ringing out as much moisture as possible. This worked fine for ravioli, but the cheese would have been better if we had the time to let it sit. Combine all ingredients in a medium bowl and stir together until basically homogeneous. The recipe below makes roughly 1lb of pasta. For 6 adults, I made a double batch. Measure flour out into a food processor and pulse until fluffy. Add eggs and mix for 30 seconds straight, then pulse for an additional minute or so as the dough forms a ball. It will look like small pebbles at first, then eventually come together. If it stays in pebble form for 45-60 seconds, add 1-2 t water (1t at a time). I made two batches of dough and each one needed about 1 1/2 t water. roll dough ball and few remaining pebbles onto a dry counter and knead for 1-2 minutes. cover dough w/ plastic wrap and let rest for 15 min- 2 hours. Feed through pasta machine to create 5-6″ wide sheets for ravioli. Or, if you’re like me, use a rolling pin and make it AS THIN AS POSSIBLE. Add a dollop (t sized) of ricotta mixture in a row along dough strip, fold dough in half and push closed around ricotta. Using a pastry wheel (or regular knife), cut between each ricotta pouch and trim excess dough off seam edges. cook for 4-5 min in pot of rapidly boiling salted water. Joe is a master at these kind of pasta dishes. When asparagus is in season, he makes the same thing with that. Bring a large pot of salted water to boil and cook pasta according to the box. Saute garlic in olive oil in a large skillet. Add zucchini and saute until soft (about 6 minutes). Add tomatoes and spices and continue simmering for 5-7 minutes. Once the pasta has finished cooking, drain and add to the skillet and continue cooking for a minute or two. Serve and sprinkle Parmesan cheese on top.